That familiar half-starved feeling is what sends most of us off the rails when we’re trying to shift the pounds. But if you follow these hints and tips, you can stay satisfied for longer and lose weight. Better still, you can even eat more food than before. With zero calories, water is the perfect slim line filler. But recent research has shown that it is better incorporated into meals than drunk alongside them. EAT BIG: Go for soups with lots of water-rich vegetables. Food that absorbs water during cooking, like pasta and rice, are good bulkers – but watch portion sizes. 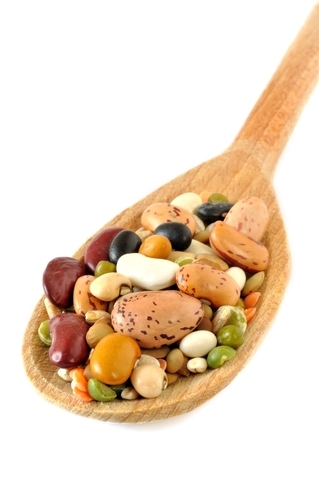 Foods rich in protein are particularly good at making you feel fuller quicker and for longer. It’s thought they stimulate the release of hunger-controlling hormones in the gut. EAT BIG: Add playing card sized portions of your favourite protein to your lunch and dinner. Choose from lean meat, skinless chicken or turkey, grilled fish, Quorn, tofu or fresh prawns. EAT BIG: Exchange white carbohydrates for brown – choose wholemeal bread, whole-wheat pasta, brown rice and breakfast cereals that are labelled wholegrain, but check sugar and salt content. Pulses like peas, beans and lentils are rich in soluble fibre, which absorbs water and swells, creating a feeling of fullness. They also lower the GI (glycaemic index) of the meal they’re added to, slowing the rate of sugar absorption and so helping keep energy levels stable and hunger at bay. EAT BIG: Use them to bulk out stews, soups and casseroles. Try baked beans on toast or with a jacket potato to make a quick satisfying meal. Fat – It’s the least filling nutrient with nine calories per gram, compared with four calories per gram found in protein and carbohydrate. Consuming moderate quantities of heart-healthy unsaturated fats in olive oil and vegetable oil is good, but measure with a tablespoon rather than random glugging. One tablespoon will be all you’ll need for a stir-fry, for example. Sugary drinks- The calories in beverages don’t trigger the body’s fullness mechanism anywhere nears as efficiently as those in solid food. Stick to water or the occasional diet drink instead. Alcohol- Drinking lowers blood sugar levels, leading to increased hunger. Make it a rule to drink alcohol only with meals, when you’ll find it easier to stick to a sensible amount of one or two small glasses. Are you struggling to lose weight? Try some of the tips above and let us know how you get on.